RESULTS AND CONCLUSION: The study tests both CSR performance and CSR disclosure against both real earnings management (REM) and accrual-based earnings management (AEM). CSR performance and earnings management: Companies with better CSR performance were more likely to engage in EM through income increasing discretionary accruals. This suggests that managers who inflate earnings may engage in CSR activities to avoid unwanted scrutiny from stakeholders. Companies with better CSR performance were less likely to engage in REM, suggesting that managers with better CSR performance regard the management of earnings through accruals that reverse in the next period less incriminating than managing earnings through actual company resources. CSR disclosure and earnings management: Companies that integrated their CSR disclosures more into their annual report engaged less in income decreasing discretionary accruals, suggesting that managers with incentives to make more CSR .disclosures to reduce information asymmetry will also be less inclined to manage earnings. Management may engage in corporate social responsibility (CSR) to disguise corporate misconduct (Hemingway & Maclagan 2004). One form of corporate misconduct, earnings management (EM), is defined as management's use of judgement in financial reporting in order to mislead stakeholders about the underlying financial performance of the company (Healy & Wahlen 1999). This study makes some advances on the prior literature. Firstly, it is the first study to ascertain whether companies classified by the Johannesburg Stock Exchange (JSE) as SRIs are, indeed, also 'socially responsible' when it comes to the transparency of their earnings. Secondly, prior studies that tested the relationship between CSR performance and earnings management (Gargouri, Shabou & Francoeur 2010; Kim, Park & Wier 2012; Lassaad & Khamoussi 2012) did not control for the effect of CSR disclosure in their analyses. CSR disclosure has been shown to be significantly correlated with earnings management (Martínez-Ferrero, Garcia-Sachez & Cuadrado-Ballesteros 2013; Suteja, Gunardi & Mirawati 2016; Yip, van Staden & Cahan 2011). By adding an additional variable, namely, CSR disclosure, when testing the relationship between CSR performance and earnings management, this study unbundles the effects of CSR disclosure and CSR performance on earnings management. Thirdly, this study tested the association between CSR disclosure and earnings management of large, listed South African companies, using a rigorous research design. Previous studies have used simple measures of CSR disclosure such as word count, sentence count or page count (Pinto, de Villiers & Samkin 2014), disregarding the actual content of the disclosure. This study improves on these prior studies by firstly using four different measures of CSR disclosure, including a composite disclosure measure, which analyses the content of the CSR disclosure and not just the amount of disclosure. All data used in the measures of CSR disclosure were independently collected by a reputable audit firm (KPMG Inc.), which increases its credibility. Fourthly, prior studies that tested the association between earnings management and CSR disclosure did not control for CSR performance in their analyses. As discussed, several studies have found significant associations between CSR performance and earnings management; however, none of these studies controlled for this in their analyses. The remainder of this paper is set out as follows: the 'Related literature and formulation of hypotheses' section discusses relevant literature and the theoretical framework used in the study and formulates the research hypotheses. 'Method' section describes the research design. 'Results' section presents the results of the study and the 'Conclusion' section contains concluding remarks. The ethical hypothesis states that managers have an incentive to be ethical, honest and transparent in their financial reporting and to be socially and environmentally responsible in their activities. If stakeholders believed that earnings were being managed or that a company was not being socially responsible, the company concerned may lose value in the market. Turyakira, Venter and Smith (2014) found a positive relationship between society-related CSR activities and competitiveness of small and medium-sized enterprise (SMEs). 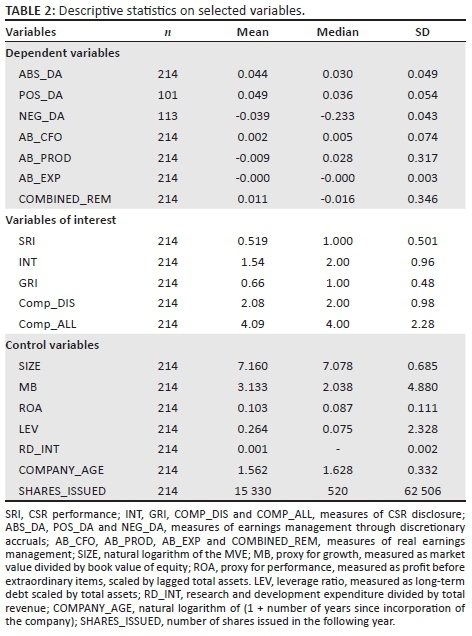 Martínez-Ferrero, Banerjee and García-Sánchez (2016) found that CSR increases corporate reputation and reduces cost of capital, while earnings management reduces corporate reputation and increases cost of capital. A tarnished corporate reputation, decreased competitiveness and increased cost of capital would have dire consequences for managers (job loss, reduction in salary, etc.). Thus, it is these dire consequences that may motivate managers to act ethically. Such 'ethical' managers would then be less inclined to manipulate earnings, and they would endeavour to ensure that the company's reputation was not compromised by inappropriate social and environmental activities. Kim et al. (2012) found support for this hypothesis in their investigation of a sample of companies in the United States. They found that companies with higher CSR performance scores delivered more transparent financial information to investors. In a study of Malaysian companies, it was found that companies supplying Islamic products (and therefore assumed to be complying with the principle of preserving the interests of society, and not only the interests of the manager) were not engaging in CSR to cover up earnings management (Ibrahim et al. 2015). In addition, South Korean firms engaging in CSR (measured as donations expenditure) were also less likely to engage in earnings management through discretionary accruals (Pyo & Lee 2013). Bozzolan et al. (2015), in an international study of 24 countries, found that CSR activities act as a constraint for REM but not AEM. REM negatively affects the future financial performance of a company which CSR-orientated companies seek to avoid. This also suggests some support for the ethical hypothesis as CSR-orientated companies were found to be less likely to engage in REM, which may negatively affect a company's future financial performance. Interestingly, REM seems to be even more constrained by CSR activities in countries with strong legal enforcement (Bozzolan et al. 2015). These results suggest that countrywide institutional factors (e.g. societal values and legal enforcement) may curb a manager's unwanted behaviour and therefore play a moderating role in the relationship between CSR performance and earnings management. Prior studies have shown that, countrywide, institutional factors influence the relationship between CSR activities (performance) and earnings management. In this study, in order to reduce the 'noise' of institutional factors, we focus solely on South African companies. In doing this, we add to the scant research on the relationship between CSR and earnings management in emerging economies, and to our knowledge, the first to test the relationship in an African country (namely, South Africa). Grougiou et al. (2014) found that earnings management in US Banks drives CSR, suggesting that bank managers engaging in questionable financial reporting practises are also likely to be engaging in CSR to deflect unwanted attention. Martínez-Ferrero et al. (2016), in a study of companies in 26 countries, found that as expected CSR had a positive effect on a company's cost of capital. Interestingly, the favourable effect was greater in companies where earnings management was detected. This indicates that stakeholders are unable to identify when CSR is being used to 'greenwash' earning management. Once again, it was found that countrywide institutional factors, specifically the legal environment in which a company operates, play a moderating role with investors less likely to fall for managers' greenwashing antics in common law countries (when compared to civil law countries). This is largely because of increased investor protection in common law countries (Martínez-Ferrero et al. 2016). Thus, if managers are managing earnings opportunistically and engaging in CSR activities in an attempt to 'greenwash' the misstated financial results, it is feasible to expect a positive relation between CSR performance and earnings management. Managers may be driven by self-interest (Jensen & Meckling 1976) in deciding what disclosures to make to shareholders with voluntary CSR disclosures being associated with positive economic outcomes (Healy & Palepu 2001) such as higher share prices (De Klerk & De Villiers 2012; De Klerk, De Villiers & Van Staden 2015; De Villiers & Marques 2016). CSR disclosures are still primarily voluntary with managers having discretion over what and how much is disclosed (Del Sordo et al. 2016; De Villiers 1998, 1999, 2003; Massa, Farneti & Scappini 2015; Rao & Tilt 2016). These decisions are often driven by environmental factors (Amoako, Lord & Dixon 2017; Borghei, Leung & Guthrie 2016; Green, Taylor & Wu 2017; Khan & Gray 2016; Leung & Gray 2016; Welbeck 2017). Individual shareholders (De Villiers & Van Staden 2010a, 2011) and institutional investors (Solomon & Solomon 2006) require corporate environmental disclosure, use it in their investment decision-making (Radley Yeldar Limited 2012) and hold companies accountable for their environmental impacts (De Villiers & Van Staden 2010b). Atkins and Maroun (2015) interviewed institutional investors and found that they thought that reporting on environmental and social issues was an important source of legitimacy in the South African capital markets. Fund managers are also beginning to use these traditional 'soft issues' in their formal analyses (Atkins et al. 2015). The researcher identified all the South African companies for which CSR disclosure data had been collected for the purposes of KPMG's published 2008, 2011 and 2013 reports on CSR reporting practices (KPMG 2008, 2011, 2013). KPMG did not collect CSR disclosure data for the other years. CSR disclosure data for 100 companies for each of the 3 years were collected by KPMG, resulting in an initial sample of 300 company-years. Financial data to compute the earnings management measures for the companies were obtained from the IRESS database. Following prior research, financial companies were eliminated from the final sample because of their differing financial ratios (Zang 2012). The final sample consisted of 214 company-years (72 for 2008, 78 for 2011 and 64 for 2013). 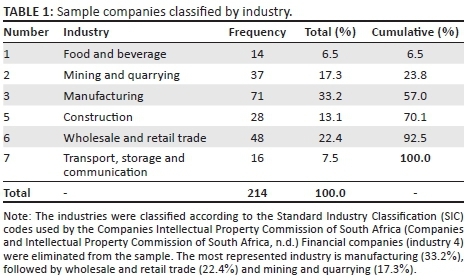 Table 1 presents the breakdown of company-year observations per industry. During 2004, the JSE launched the JSE SRI Index (JSE 2014a). Eligibility for inclusion in the SRI Index is based primarily on a company's environmental performance, social and economic sustainability, corporate governance and commitment to climate change (JSE 2014b). All companies in the All Share Index are automatically rated against these criteria and a list of companies that meet these criteria is issued annually by the JSE (JSE 2014a, 2014b). The companies cannot voluntarily decide to be rated. Only publicly available information is assessed and no information is accepted directly from the companies. FTSE International Limited (FTSE) calculates the ratings on behalf of the JSE. An independent committee comprising experts from the investment community, NGOs, unions and academia reviews all ratings. This increases the credibility and transparency of the information obtained. The proxy for CSR performance used for the purposes of this study is an indicator variable equal to 1 if the company is included in the SRI Index and 0 if not. Comp_DIS: This is a composite measure of disclosure combining the level of integration of the CSR disclosures in the annual report (INT) and whether the company issues a stand-alone CSR report and/or CSR information is available on the company's website. Comp_ALL: This is a composite, all-inclusive measure which combines the level of integration of the CSR disclosures in the annual report (INT); an indicator if the company uses the GRI guidelines when disclosing CSR information (GRI); an indicator if the company issues a stand-alone CSR report and/or CSR information is available on the company's website; an indicator if a company addresses supply chain issues in its CSR disclosure; an indicator if the CSR disclosures have been assured by a third party; a measure of the scope of any assurance provided on the CSR disclosures (e.g. whether the whole CSR report or only certain chapters and/or indicators were assured); and, finally, a measure of the level of assurance (e.g. positive assurance or limited assurance) provided by the assurance provider. Several prior studies used discretionary accruals as a proxy for earnings management (Cohen & Zarowin 2010; Kim et al. 2012; Zang 2012). Similarly, this study used discretionary accruals as the first proxy for earnings management as accruals may be used by managers to manage earnings either upwards or downwards. The study used a modified Jones' (1991) model as specified by Dechow, Sloan and Sweeney (1995) and controlled for the book-to-market value of equity (growth) as well as current year cash flows before extraordinary items and discontinued operations (performance) as specified by Larcker, Richardson and Tuna (2007). Using data from the IRESS database, the study estimated discretionary accruals (ε) for all the companies in the sample per industry for each of the sample-years 2008, 2011 and 2013 (cross-sectional). Roychowdhury (2006) defines REM as management actions that are not in line with normal business practices and with the main objective of meeting certain earnings thresholds. Roychowdhury found that companies use REM in order to avoid losses and either to meet or to beat analysts' forecasts. He found that managers increase sales by offering price discounts and lenient credit terms and reduce the cost of inventories sold (COGS) through the overproduction of inventory, which lowers the amount of fixed production costs allocated to each item of inventory (Zang 2012). Roychowdhury (2006) and Zang (2012) also found that managers reduce discretionary expenses such as advertising and research and development expenditure in order to increase profits. Real earnings management is not desirable to stakeholders as it may reduce a company's value in future periods as customers may demand the reduced selling price in the future. Lenient credit sales may increase doubtful debts and increase opportunity costs as debtors need to be financed, while excessive inventory on hand carries additional holding costs, as well as the risks of potential write-downs if the net realisable value falls below the cost price of such inventory. Reducing advertising and research and development costs may reduce future sales, as well as potentially cause companies to lose their competitive advantages. In line with Kim et al. 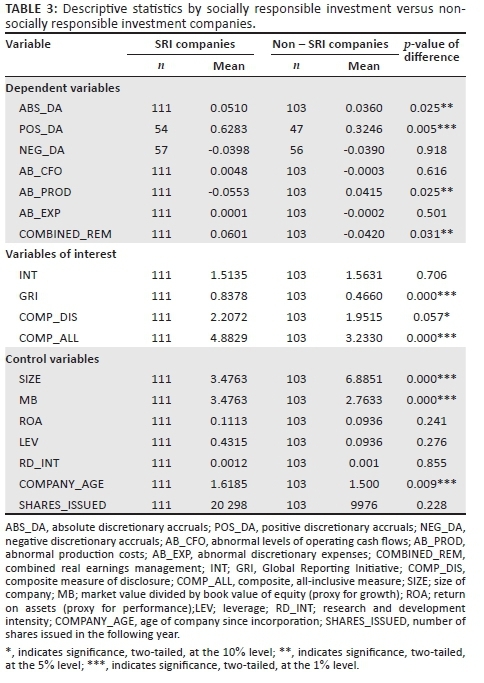 's (2012) study, this study estimates the abnormal cash flows, abnormal production costs (AB_PROD), abnormal discretionary expenses (AB_EXP) as well as a combined measure using the models below. Abnormal production costs: Higher production costs than the industry norm (ε) when regressed on sales may indicate earnings management by the overproduction of inventories. The overproduction of inventories reduces the cost of goods sold as the fixed production costs are spread over a larger number of items (assuming that the 'saving' from fixed production costs being allocated to more individual inventory items is greater than the variable costs incurred to produce one additional item). Thus, higher AB_PROD may indicate more REM, through the overproduction of inventory and lower accounting quality. The regression model is based on Kim et al. 's (2012) study. However, it has been extended to include an additional variable of interest, a measure of CSR disclosure in order to 'unbundle' the effects of CSR disclosures and CSR performance on earnings management. CSR performance has been shown to be significantly correlated with earnings management (Gargouri et al. 2010; Kim et al. 2012; Lassaad & Khamoussi 2012); however, none of these studies controlled for the effect of CSR disclosures. CSR_DISCLOSURE is the measure of CSR disclosure. The measures are detailed in the 'Corporate social responsibility disclosure measures' section of this article. Additional tests, controlling for both year and industry, were conducted. The untabulated results are discussed in the 'Additional regressions controlling for years and industry' section. 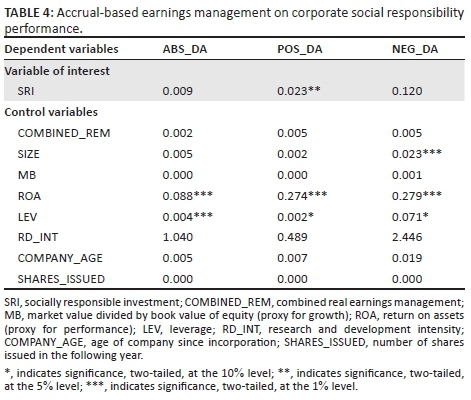 The results depicted in Table 4 suggest that there is no overall association between earnings management through discretionary accruals (ABS_DA) and CSR performance (SRI). When ABS_DA were split between POS_DA and NEG_DA, there was a significant positive relation between POS_DA and SRI (p < 0.05), suggesting that companies with better CSR performance are more likely to engage in earnings management through income increasing discretionary accruals. This may suggest that companies that are managing their earnings upwards are engaging in more CSR activities, possibly to divert the attention of investors away from their misconduct. Gargouri et al. (2010) found a positive correlation between CSR performance and earnings management, and suggest that the cost of CSR activities reduce financial performance and subsequently give management an incentive to manage the earnings. This notion finds some support for hypothesis H1B (the opportunistic hypothesis). These results hold true, after controlling for the effects of CSR disclosure on earnings management (see 'Corporate social responsibility disclosure and earnings management through discretionary accruals' section). Suteja et al. (2016) found that companies use CSR activities to cover up earnings management and not out of social responsibility and caring. In line with Kim et al. 's (2012) study, the results also suggest that larger companies are less likely to engage in income reducing discretionary accruals as compared to smaller companies (p < 0.01). Turning to the control variables, companies with a higher debt ratio leverage (LEV) are more likely to have more positive discretionary accruals and less negative accruals. This is consistent with managers attempting to increase earnings to avoid violating debt agreements (Kim et al. 2012; Yip et al. 2011). 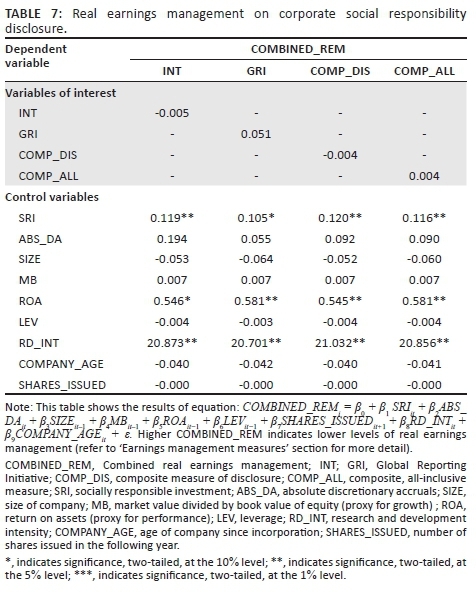 The results depicted in Table 5 suggest that COMBINED_REM is positively and significantly (p < 0.05) associated with SRI, thereby indicating that companies with better CSR performance are less likely to engage in REM (higher COMBINED_REM indicates lower levels of earnings management). Bozzolan et al. (2015) also found that CSR activities act as a constraint for REM (REM) but not AEM. Real earnings management negatively affects the future financial performance of a company, which CSR-orientated companies seek to avoid. This also suggests some support for the ethical hypothesis as CSR-orientated companies were found to be less likely to engage in REM, which may negatively affect a company's future financial performance. Interestingly, REM seems to be even more constrained by CSR activities in countries with strong legal enforcement (Bozzolan et al. 2015). In the untabulated results, consistent with our descriptive statistics, the measure of COMBINED_REM is primarily driven by the overproduction of inventory (AB_PROD) in order to reduce the fixed cost allocated per item and, ultimately, to reduce the cost of sales. Thus, companies with better CSR performance are less likely to engage in REM, specifically relating to the overproduction of inventory. This notion finds some support for hypothesis H1A (the ethical hypothesis). These results hold true after controlling for the effects of CSR disclosure on earnings management (see 'Corporate social responsibility disclosure and real earnings management' section). Managers use REM and AEM as substitutes for one another, based on their relative costliness (Bozzolan et al. 2015; Zang 2012). 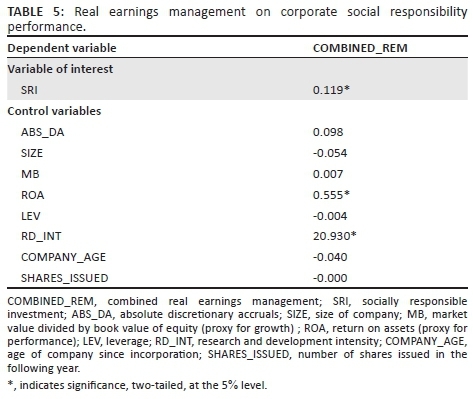 Real earnings management potentially imposes a greater future cost on the company than AEM (Roychowdhury 2006) and is less likely to be detected (Zang 2012), which may explain why these 'ethical' managers find it less incriminating to increase profits through discretionary accruals (that will reverse in future periods) than to engage in REM with actual company resources. Kim et al. (2012) found that CSR activities were associated with less REM, finding support for the ethical hypothesis. Turning to the control variables, companies with better financial performance (ROA) (Kim et al. 2012), as well as those that employ more financial resources in research and development, are less likely to engage in REM. The JSE annually assesses listed companies' CSR performance and issues a SRI index. A company included on this index is seen to be a better CSR performer and, as such, is used in this study as an indicator of CSR performance. The overall results found no association between CSR performance and either AEM or REM when controlling for CSR disclosure. However, it was found that companies with better CSR performance are more likely to engage in earnings management through income increasing discretionary accruals. Prior studies have suggested that managers act in self-interest and inflating earnings may result in better job security, earnings potential, etc., for managers. The results suggest that managers who are inflating earnings may engage in CSR activities in an attempt to 'greenwash' their misstated earnings to avoid unwanted scrutiny from stakeholders. Prior studies have shown that countrywide institutional factors influence the relationship between CSR activities (performance) and earnings management. In this study, in order to reduce the 'noise' of institutional factors, we focused solely on South African companies. In doing this, we add to the scant research on the relationship between CSR and earnings management in emerging economies, and to our knowledge, the first to test the relationship in an African country (namely, South Africa). This study makes some advances on the prior literature. Firstly, it is the first study to ascertain whether companies classified by the JSE as SRIs are, indeed, also 'socially responsible' when it comes to the transparency of their earnings. Secondly, prior studies that tested the relationship between CSR performance and earnings management did not control for the effect of CSR disclosure in their analyses. CSR disclosure has been shown to be significantly correlated with earnings management. By adding an additional variable, namely CSR disclosure, when testing the relationship between CSR performance and earnings management, this study unbundles the effect of CSR disclosure and CSR performance on earnings management. 1. During 2004, the Johannesburg Stock Exchange (JSE) launched the JSE Socially Responsible Investment (SRI) Index (JSE 2014a). Eligibility for inclusion in the SRI index is based primarily on a company's environmental performance, social and economic sustainability, corporate governance and commitment to climate change (JSE 2014b). All companies in the All Share Index are automatically rated against these criteria and a list of companies that meet these criteria is issued annually by the JSE (JSE 2014a, 2014b). 3. If CSR disclosures are made in the directors' report and in a separate section in the annual report, a score of 3 is awarded. If CSR disclosures are made in a separate section of the annual report only, a score of 2 is awarded. If CSR disclosures are made in the directors' report only, a score of 1 is awarded. If CSR disclosures are not made in the annual report, a score of 0 is awarded. The higher the INT score, the more integrated the CSR disclosure is in the annual report.